Late notice replacement Jessica-Rose Clark stunned Octagon veteran Bec Rawlings in their UFC Fight Night co-main event at Qudos Bank Arena in Sydney, winning the battle of Aussie flyweights via split decision. Scores were 29-28 twice and 28-29 for Innisfail’s Clark, 8-4, 1 NC, who replaced the injured Joanne Calderwood. Brisbane’s Rawlings falls to 7-7. And it was on short notice! Rawlings got off to a good start with an aggressive attack in the first round that included some crisp striking and a takedown. Clark got in her shots as well and reversed position on the mat, but it was in round two that she surged, nearly locking in an arm triangle choke after a takedown set up by some hard shots on the feet. In the third, the round could have gone either way as both looked to take over, but it was a late run by Clark that likely earned her the victory on two of the three scorecards. Clark missed weight for the bout, coming in at 128 pounds. Welterweight prospect Belal Muhammad made it three straight wins in the welterweight shark tank as he scored a three-round split decision over veteran Tim Means. Scores were 29-28 twice and 28-29 for Muhammad, now 13-2. Means, who replaced Jesse Taylor in the fight, falls to 27-9-1 with 1 NC. Means took control early as he fought well at range while keeping the pressure on Muhammad. Soon enough, though, Muhammad began to find his way inside Means’ reach, allowing him to get off his shots in a competitive frame. Muhammad took the bout to the mat in the opening minute of round two, but the fighters didn’t stay there long, opting to resume their close standup battle. This back and forth battle continued into the third frame, but Muhammad kept pressing and scored with a wider variety of telling attacks, leading him to victory. Returning after a year away and back in the welterweight division, Australia’s Jake Matthews won a three-round split decision over Bojan Velickovic. Matthews (12-3) sought the takedown immediately, and as it took him nearly two minutes to get it, he ate several elbows and punches in the process. And once Velickovic (15-6-1) hit the deck, he rose immediately. Matthews kept pushing to take it to the mat and with a little over a minute left he did it, but he wasn’t able to do much with the takedown and the two were upright by the end of the round. 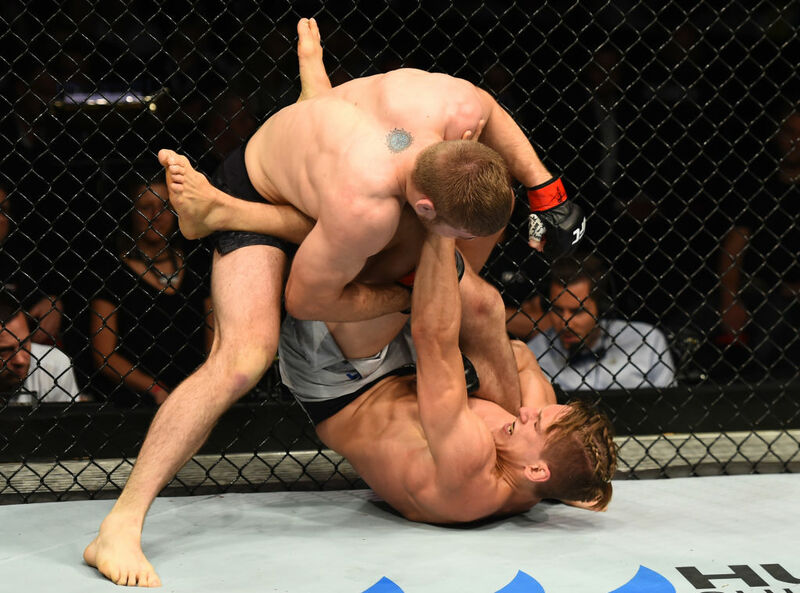 A sloppy shot by Matthews put the Aussie in trouble to start round two, as Velickovic nearly locked in a guillotine choke, and while Matthews escaped, Velickovic took his back seconds later. With less than two minutes left, Matthews got loose and back to his feet, but Velickovic was clearly the fresher fighter. Matthews got the takedown to begin the third round, but Velickovic was able to work his way into back control once again. After a spell there, it was Matthews scrambling his way into the top spot, and he landed a series of point-scoring lefts there before talking his opponent’s back. The last scramble was won by Velickovic, but ultimately the decision went to Matthews by scores of 29-28 twice and 28-29. In an entertaining middleweight bout between former TUF Nations castmates, Elias Theodorou won a three-round unanimous decision over Daniel Kelly. Theodorou used his kicks and effective movement to control the first round against the aggressive but largely ineffective Kelly. The four-time Olympian remained dangerous, though, and while he missed several haymakers, when he did land, he got the Canadian’s attention. As Theodorou began to slow down and get into more exchanges with Kelly, the Melbourne product began to have more success, including a trip to the mat. A low blow by Theodorou gave both fighters a brief break, and once the fight resumed, so did the striking exchanges, where “The Spartan” landed several head kicks but with little effect on Kelly, who kept marching forward. Finding his second wind in round three, Theodorou kept throwing, but Kelly nearly found his miracle comeback when he took the Canadian down and nearly locked in a rear naked choke. Theodorou patiently fought his way free and back to his feet, and he got back to work, outlasting the ultra-tough Kelly by scores of 30-28, 30-27 and 30-26. The third opponent was the charm for Australian featherweight prospect Alexander Volkanovski, who pounded out a one-sided three-round unanimous decision over late replacement Shane Young. Scores were 30-27 and 30-26 twice for Volkanovski, now 16-1. Auckland’s Young, who was the third foe slated to face Volkanovski after Jeremy Kennedy and Humberto Bandenay withdrew due to injury, falls to 11-4. Volkanovski swarmed Young and kept the heat on throughout the opening round, with his pressure against the fence allowing him to the do the most damage. There was no let-up in the Windang product’s attack in round two, and while Young wasn’t getting blown out of the fight, he also wasn’t able to get into a significant offensive rhythm either. As a positive, Young was getting up every time Volkanovski put him on the deck until the final minute, when the Aussie kept him grounded until the final seconds of the second stanza. Ninety seconds into the final round, Young surprised his foe with a takedown, but Volkanovski got off the mat and wound up dumping the New Zealander to the canvas in response, continuing to deliver the punishment until the final horn. Due to the late replacement, the bout was held at a catchweight of 150 pounds.